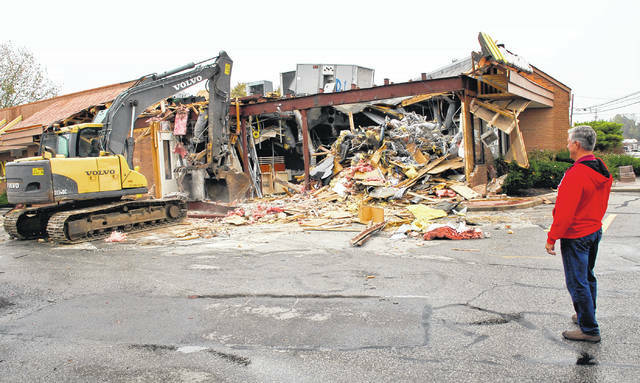 Demolition of the McDonald’s on U.S. 23 north of Delaware began Wednesday morning to make room for an upgraded store that will be completed at the end of December. Rod Boester watches as the backhoe grabs the edge of the 1985 building and pulls it to the ground. Rod Boester took time to reflect as he watched wrecking crews demolish the McDonald’s restaurant that he’s owned since the mid 1980s. He then ran to get a closer look at the HVAC system as it barely hung on before crashing to the ground. “I wondered how long it would stay up there,” he said. The McDonald’s located at 2091 U.S. 23 North, which has stood on that spot since 1985, is being removed to make room for a new 3,915-square-foot building. Boester said the new building should be completed by the last week of December. Boester said the new McDonald’s restaurant will have the updated side-by-side drive through, a 53-space parking lot, and the menu signs will be digital boards. He said they will look much like the ones at the South Sandusky Street location. The new lobby will be bigger and modern, too. The restaurant will be limited to a right turn-in only access from U.S. 23 along with two full movement curbs from the private access road between McDonald’s and the Wendy’s, where a traffic signal is located at the entrance to the Big Lots plaza. Boester received approval from the city for the new building in August of this year. In 2013, McDonald’s received approval for a permit and combined preliminary and final development plan for exterior renovations of the building, but the changes were never made. This entry was tagged delaware, fast food, food, McDonald’s, ohio, restaurant. Bookmark the permalink.